WASHINGTON — President Trump said on Monday that he was designating a powerful arm of the Iranian military as a foreign terrorist organization, the first time that the United States had named a part of another nation’s government as such a threat and raising the risk of retaliation against American troops and intelligence officers. The move, which has been debated at the highest levels within the administration, was imposed on the Islamic Revolutionary Guard Corps. The military unit has carried out operations across the Middle East, trained Arab Shiite militias and taken part in a wide range of businesses in Iran. The action imposes wide-ranging economic and travel sanctions on the military unit as well as the organizations, companies or individuals that have ties to it — including officials in Iraq, an American ally. 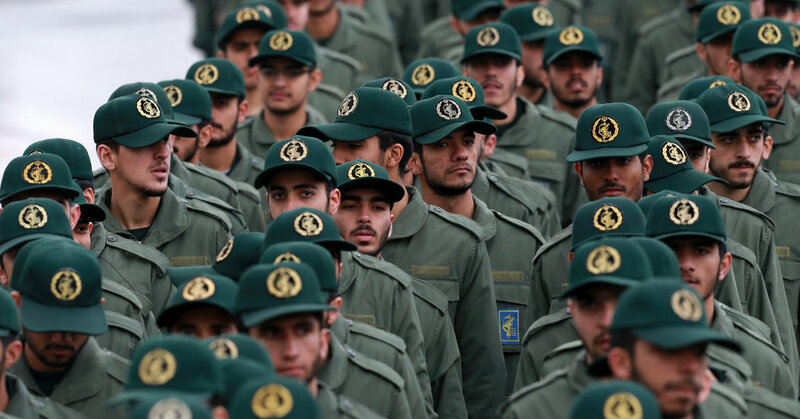 Officials in the United States said the broad terrorist designation covers 11 million members of the Iranian group and units in its hierarchy. Top Pentagon and C.I.A. officials oppose the designation, which they argue would allow hard-line Iranian officials to justify deadly operations against Americans overseas, especially Special Operations units and paramilitary units working under the C.I.A. An interagency lawyers group concluded the designation was too broad, but Secretary of State Mike Pompeo and John R. Bolton, the national security adviser, pushed for it, said a Trump administration official. The fighting among the senior administration officials intensified after The New York Times disclosed the pending designation last month. After Mr. Trump’s announcement, Iran’s Supreme National Security Council said it was designating the United States Central Command, the part of the military that oversees operations in the Middle East and Africa, as a terrorist organization. At the height of the Iraq War in the mid-2000s, Iranian military officials and partners helped train Iraqi Shiite militias to fight American troops. Senior Iraqi officials are opposed to the new designation, as it could impose travel limits and economic sanctions on some lawmakers in the Shiite-led government who have ties to Iranian officials. The additional pressure on Iranian groups also could fuel a move among Iraqi parliamentarians to limit the movements and actions of 5,000 American troops based in Iraq. Generally, Iraqi leaders say they oppose any sanctions because ordinary Iraqis suffered under broad United Nations economic penalties that were imposed after Saddam Hussein invaded Kuwait in 1990. Monday’s announcement came one day before the Israeli general elections, and the move on the Iranian group could give Prime Minister Benjamin Netanyahu a boost in the final hours of his re-election campaign. Mr. Netanyahu has repeatedly raised the specter of the Iranian threat to Israel and tried to reinforce the notion that his close ties to Mr. Trump strengthen Israeli security. Last month, in an explicit effort to bolster Mr. Netanyahu, Mr. Trump recognized Israeli sovereignty over the Golan Heights, which Israel seized from Syria in the 1967 war and annexed in 1981; the United Nations considers it occupied territory. Mr. Netanyahu has stressed the dangers posed by Hezbollah, which was designated a foreign terrorist organization by the United States in 1997 and has close ties to the Revolutionary Guard. He had asserted recently that Hezbollah was trying to set up a base in the Golan Heights. Last month, after visiting with Mr. Netanyahu in Jerusalem, Mr. Pompeo flew to Lebanon and berated officials for tolerating Hezbollah, even though it is a part of the government in Beirut. “There is a reason that successive administrations have held off designating the I.R.G.C. as a terrorist organization, and why many of Trump’s own military and intelligence officials are said to be highly opposed to the move: The potential blowback vastly outweighs the benefits,” said Jeffrey Prescott, who worked as a senior Middle East director at the White House National Security Council during the Obama administration. The Obama administration considered a series of actions against the Revolutionary Guard before entering into a nuclear deal with Tehran and world powers in 2015. Mr. Trump withdrew the United States from that agreement last year in the start of a series of crackdowns against Iran. The Revolutionary Guard oversaw the previous Iranian nuclear program, and some of its top officers were sanctioned by the United States and the United Nations for their efforts. Nicki Minaj: Is the queen of rap’s crown fading? August 22, 2018 Comments Off on Nicki Minaj: Is the queen of rap’s crown fading?